Modern residence "Bludamare", 3 storeys, built in 2016. 12 apartments in the residence. 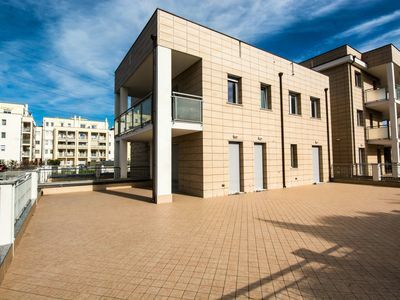 300 m from the centre of Albenga, 1 km from the sea. For shared use: garden 800 m2. Motor access to the house. Parking. Supermarket 300 m, restaurant, bar 400 m, railway station "Albenga" 1 km, shingle beach 1 km. Nearby attractions: Alassio 7 km, Loano 12 km, Le Caravelle Waterpark 6 km. Please note: main road 50 m from the property. The photograph shows a typical example. 2-room apartment 45 m2, on the ground floor. Practical furnishings: living/dining room with 1 double sofabed and TV. Exit to the terrace. 1 double bedroom. Kitchenette (2 hot plates, oven, electric coffee machine). Shower/bidet/WC. Gas heating (extra). Heating available only from 01.11. to 31.03. Terrace 20 m2. Terrace furniture. Facilities: safe. Internet (WiFi, free). Garage (extra). 1 pet/ dog allowed.